It’s official, Beth and I have agreed upon a design and woods and style. 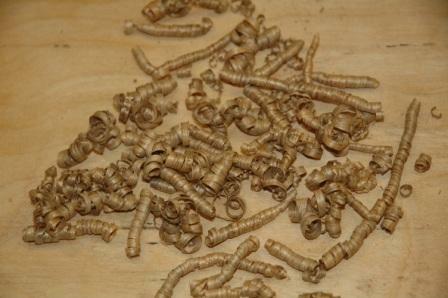 I have ordered (and partially received) the components to build Beth a Koa OM. Today, I received the Koa, from Notable Woods, and Beth is pleased with the choice. 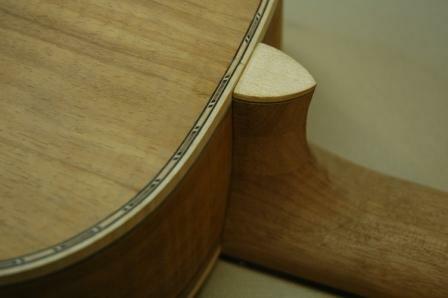 I showed in an earlier post some design considerations, and with only some slight alterations, we will proceed with ebony binding and BWB purfling with the koa and spruce body. 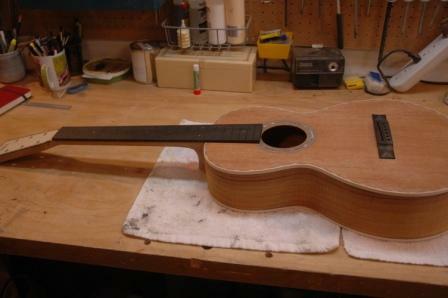 Lots of opportunity to adapt along the way and make this a really special guitar. 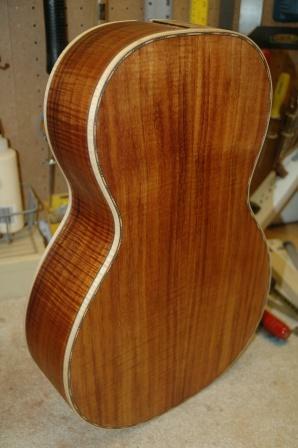 I’m even entertaining a koa headstock with a real groovy shape (for those of you who don’t know, groovy means cool). I warned Beth that it will take some months before completion, to which she replied, “But I’m playing in a wedding in June!”. 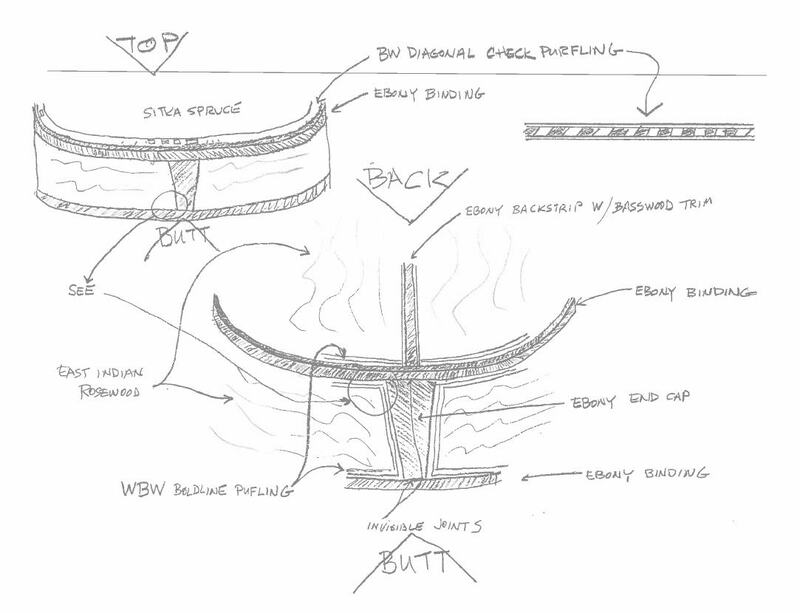 Did a few sketches of the binding and purfling for Beth’s OM. She is interested in “upgrading” the back and sides, so we’ll discuss the options Tuesday. 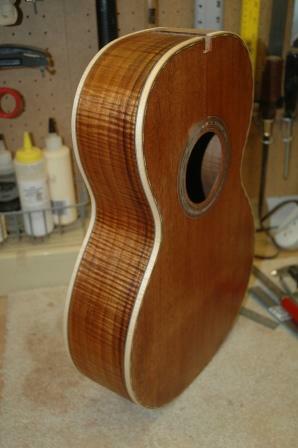 I have reached out to my friend Beth and offered to make her a guitar at cost (of materials). We met tonight to begin the design process. 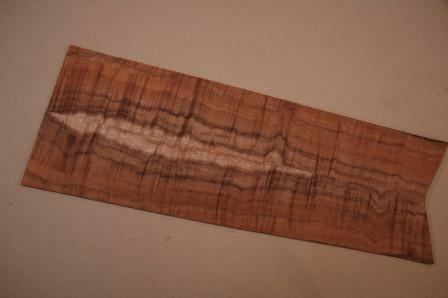 Looks like a rosewood OM will be on the workbench in the coming days. Very excited. The Phinney Neighborhood Center auction is coming in a few weeks, where I’ll hopefully have the chance to start building 905. 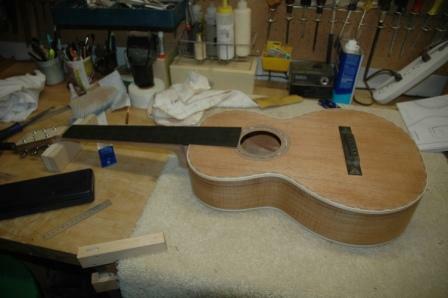 I’m beginning to wonder how many available hours there are in a day to build guitars. Thursday evenings I am visiting Rob Girdis in his shop for some master oversight. He suggested I start a new guitar and work through the process with him for advice, alternate ways of working, etc. I have a very nice Sitka spruce top, and Ovangkol back and sides so arrived with these and my bench plane to join then thickness. What we really did on Thursday was prep my bench plane. Although it is new, it needed a bit of setup to really be and effective tool. We took it apart, adjusted the frog, reversed the upside down cutting blade, sharpened, and then trued the base. Aside from having a properly sharpened blade, truing the base made all the difference in making this tool work for me. We jointed the top with the plane, then joined. 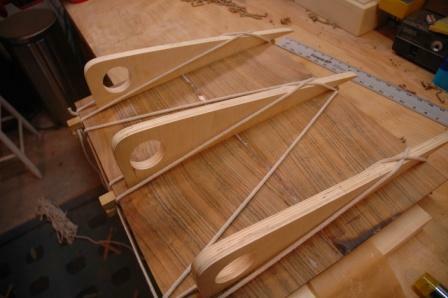 Rob’s jig is quite different than mine, and he has a railroad rail for weighing down the joined plates. Off to home to work in my own shop and try the plane on the back, then join in my jig. Lookee. That’s what a true and sharp plane can produce. Curly fries! Note there is no backstrip. Rob suggested joining then routing out a shallow channel for the backstrip, gluing in and trimming back down to the back surface. He suggests this is a stronger joint. This weekend yielded very little progress. I spent many hours in the workshop staring at my tools, staring at the workbench, sitting on my stool, listening to American Roots, and trying to unhinge myself to do some work. 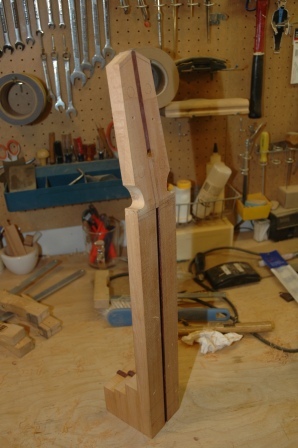 Eventually I started back by restaining the Zebrez to fix some glue spots, then getting into working on the neck and fretboard for the parlor. The parlor is really a nice little guitar. It has lots of contrast and as I bang on the box, it gives some sweet resonance. Girdis warned me that it may be a bit heavy on the top, and the bass may be lacking. 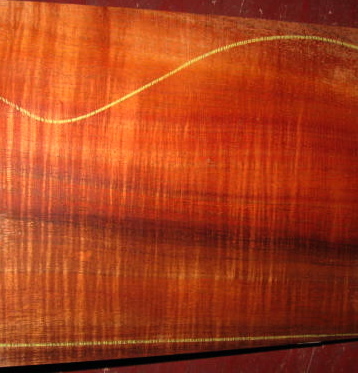 I’ll try and sand the box aggressively and bring down the thickness slightly in an attempt to boost the bass. We’ll see. I installed the neck heel laminate (maple, ebony, maple) and did some trimming. 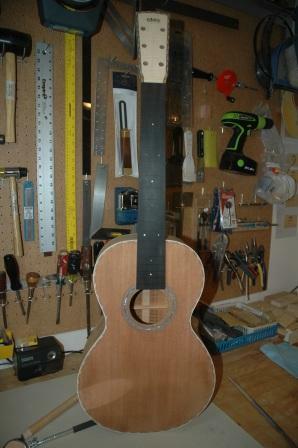 I cut the fretboard to the neck dimensions and see that the neck is still a bit wide. 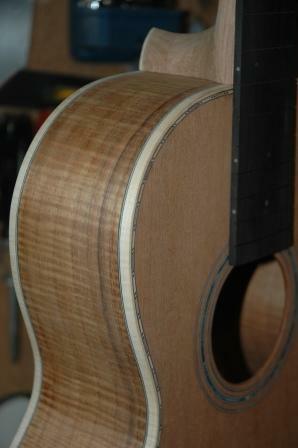 I can certainly work toward a narrower neck as too wide is easier to compensate for than too narrow. The neck plus fretboard is at 26mm, which I will have to bring down to 22mm if I want the lean mean neck I’m striving for. I may have mentioned the fretboard scale is not equal to the scale defined in the plans, but the bridge location will account for the difference. It’s not much, so I’m not concerned with the variance. It’s quite a stunning guitar. 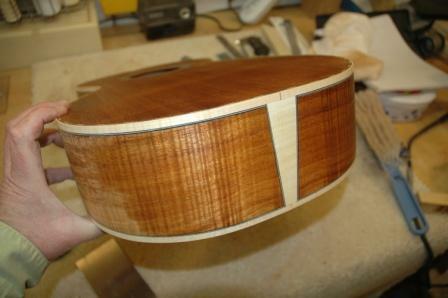 Once I get the neck width and thickness dialed in, I’m ready for the finish work. 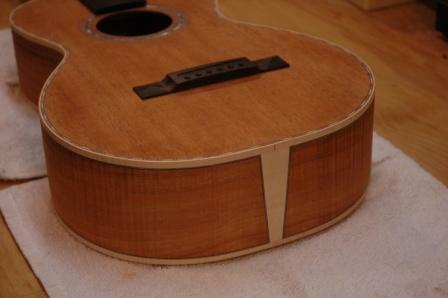 I’ve got the binding/pufling trimmed down to where the sides are square and the BWB is exposed nicely. I’m going to use very small paua dots for the fretboard, which I’ll have to order, to keep the look simple and uncluttered. I’ve decided to NOT bind the fretboard with ivroid as I’m thinking it already has enough contrast and appropriate decor. Spent a few hours in Ron Girdis’ workshop this evening. He helped me with burnishing my cabinet scraper (the best little tool in the toolbox). I continue to work on improving my binding skills, and the aggressive scraping I’m doing now is due to not quite getting the bindings fitted properly the first time. I scraped away, and am getting closer to a nice finish. 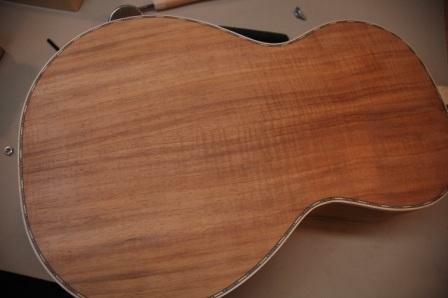 What follows is the guitar with generous swabbing of Naptha to give it the appearance of a finished lacquer.